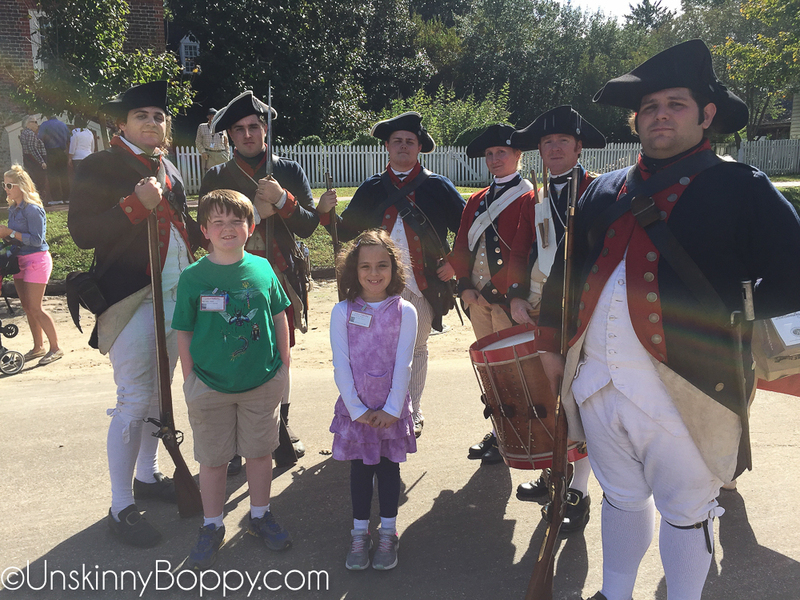 If you missed yesterday’s post about our trip to Colonial Williamsburg, be sure to read it here first. 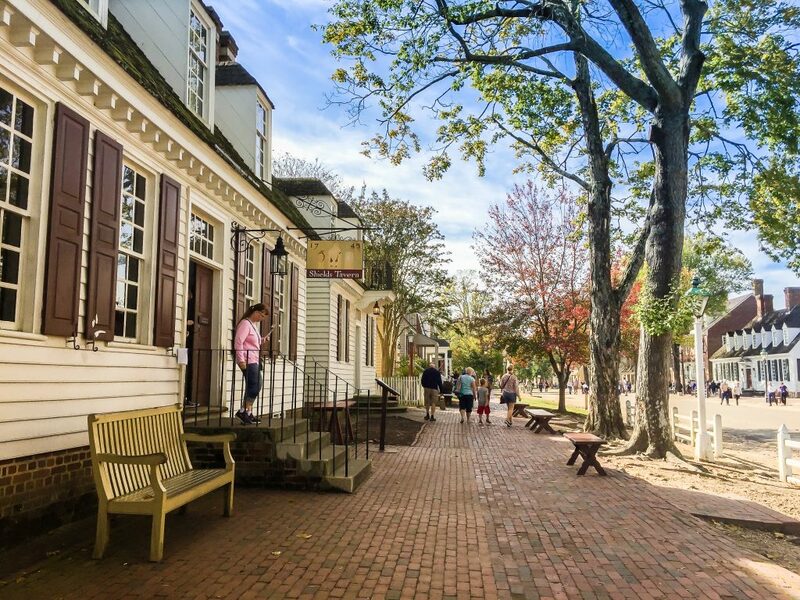 It’s chock full of photos to inspire your visit to this beautiful part of our country! On Day 2 of our trip, we took a bit of a different approach. 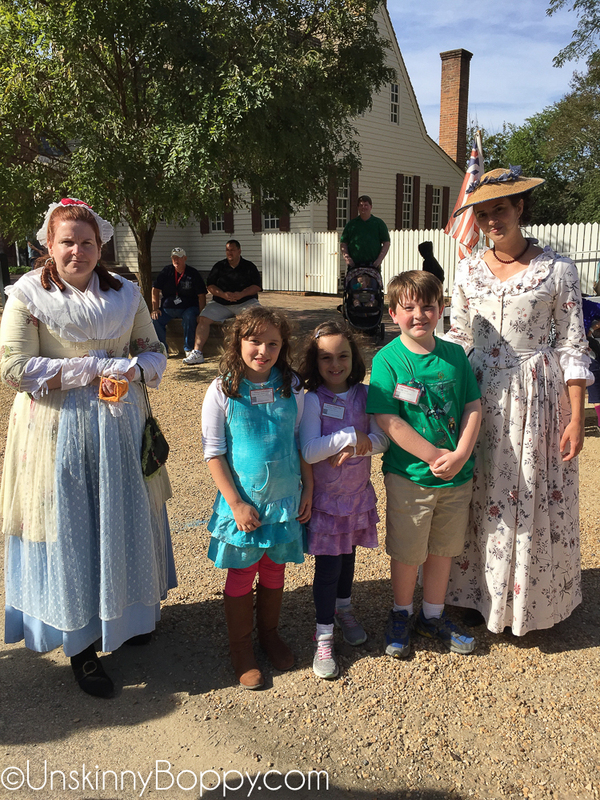 My good friend Marcia lives in the Richmond area, so she wanted to bring her twin daughters over to tour Williamsburg with us. We also took a vacation with them to Niagara Falls, so Garrett has traveled with these awesome twins just a few years before. 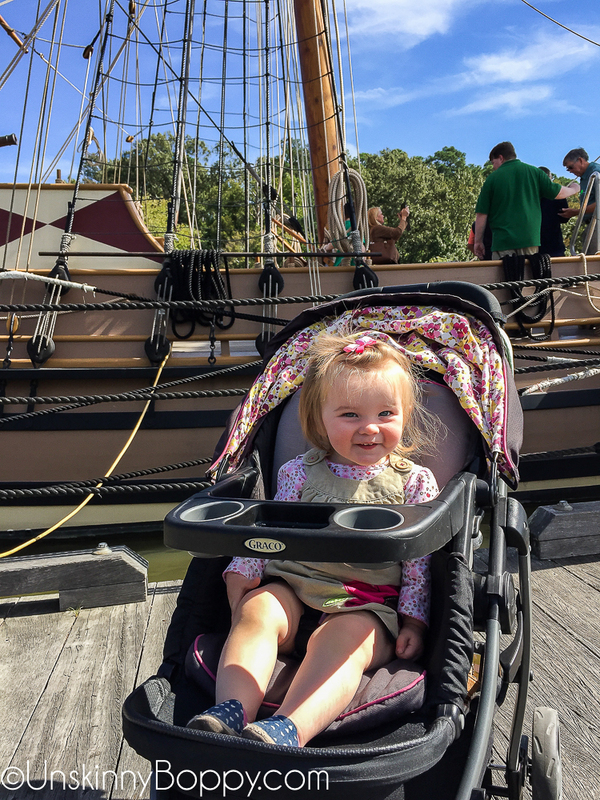 They couldn’t make it over until after lunch, so we decided to spend the morning at Jamestown colony, which is just a few miles away from Williamsburg. 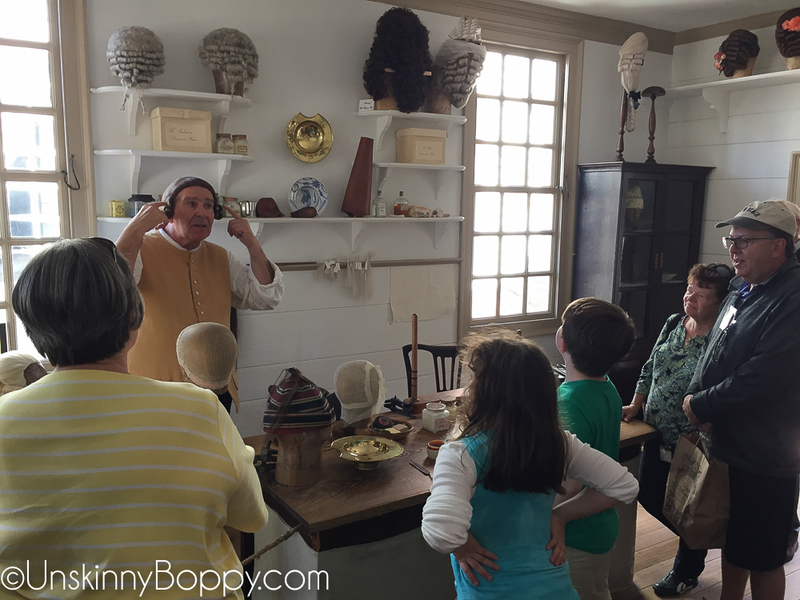 This turned out to be an excellent idea, because this place was SUPER cool and SO worth a trip with kids! 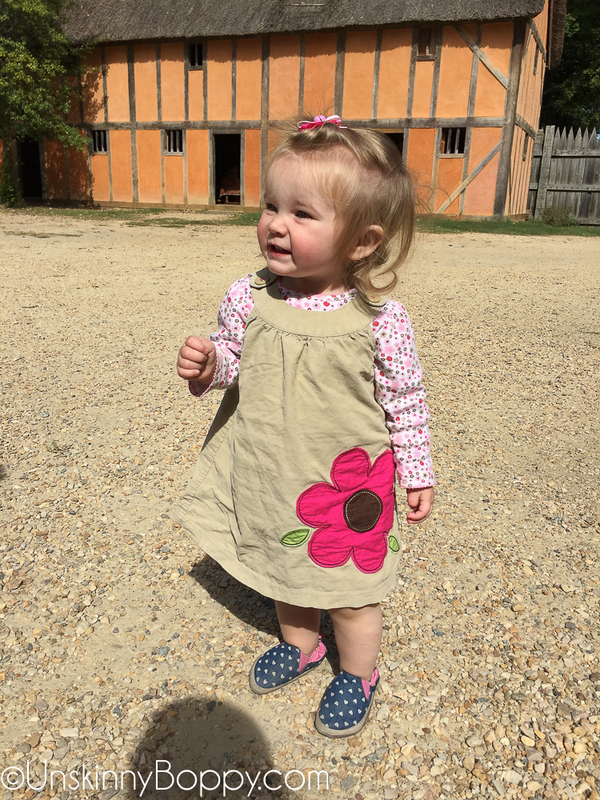 There are a few main attractions at Jamestown Settlement. You start out at the visitor’s center where you can take the museum tour. 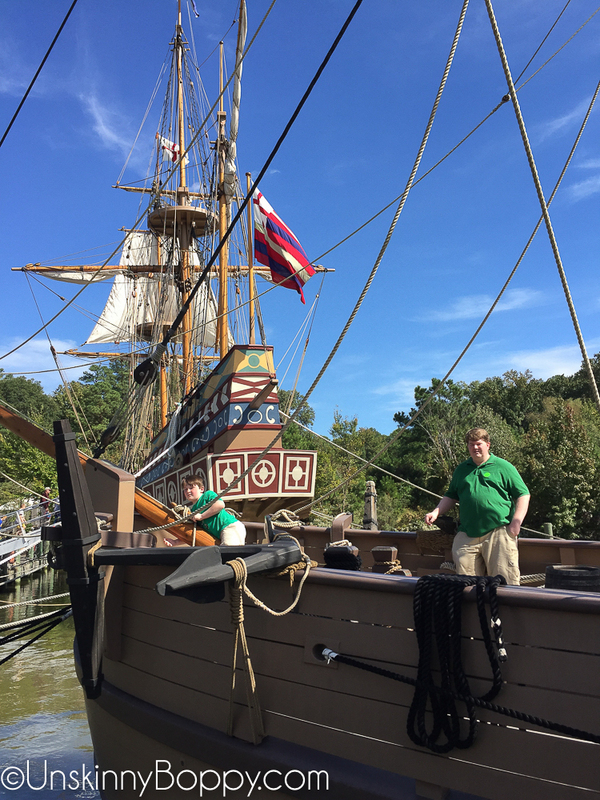 Then a path winds it way through a Powhatan Indian Village down to the ships and you make the loop back up through the Fort. Again, it was a very easy walk to see all of this. 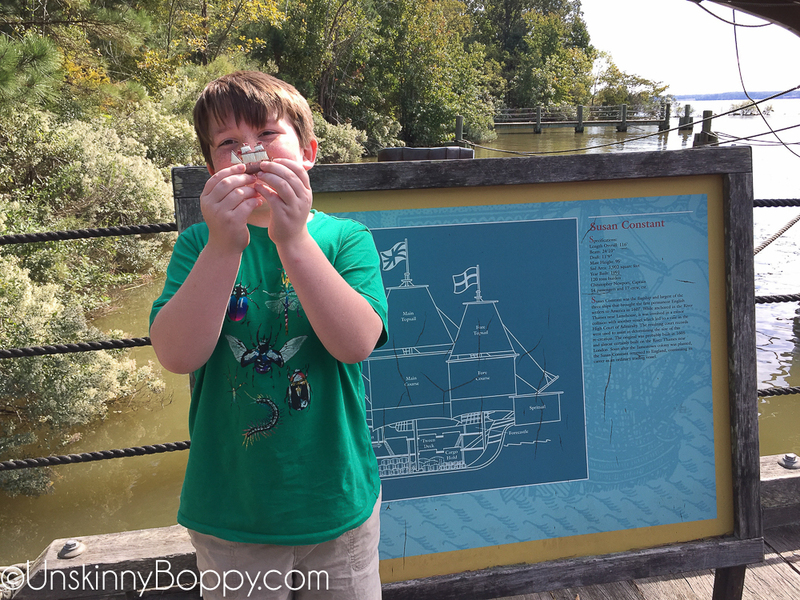 The Powhatan village was small, with lots of totem poles and teepees to climb around in. 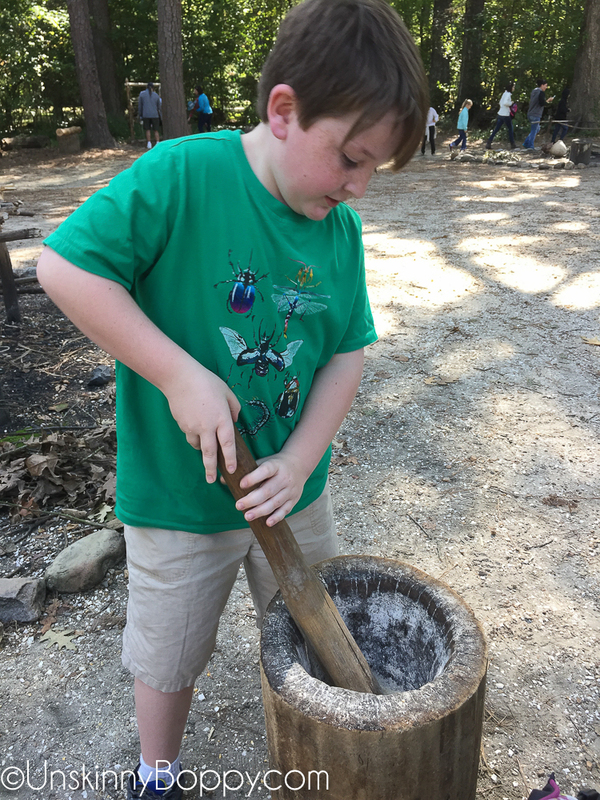 G liked grinding corn… and there will be no Outlander jokes allowed to caption this photo. 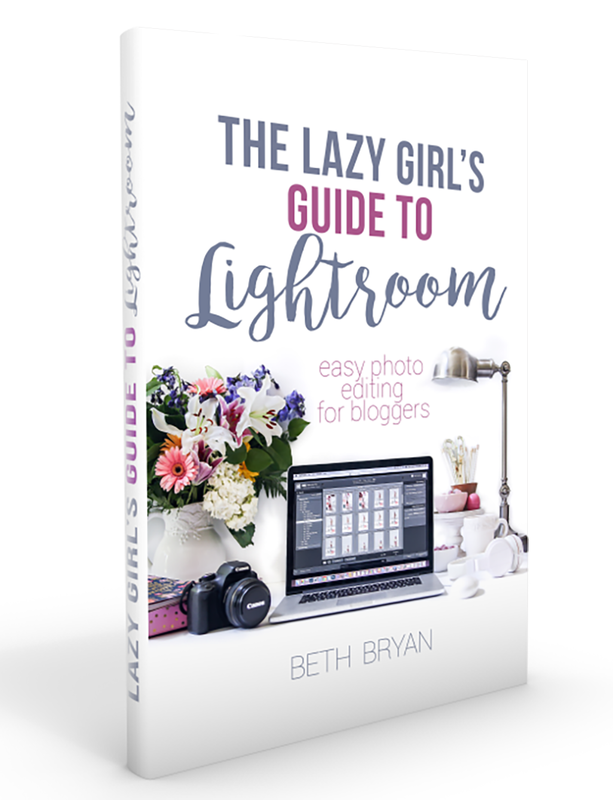 But, the coolest part? Definitely the ships! 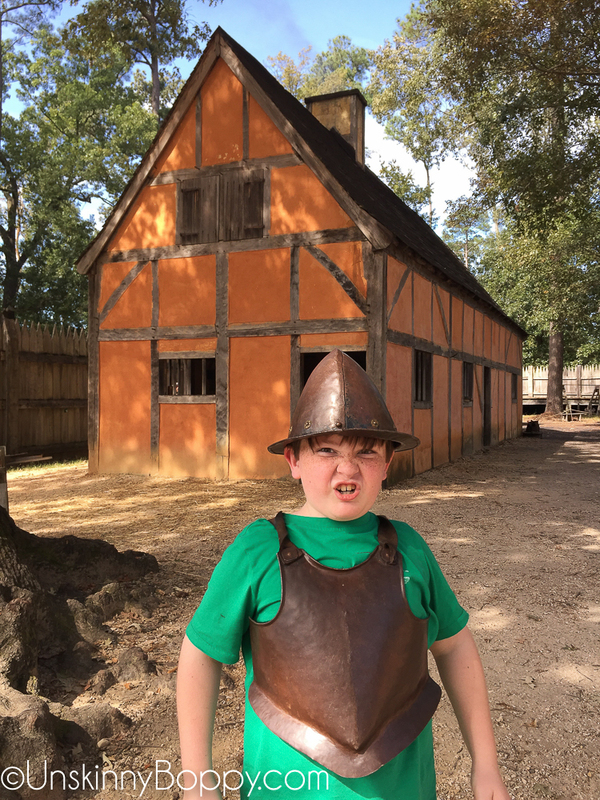 Garrett was in the 3rd grade when we took this vacation, and he had just finished studying about the Godspeed, Discovery and Susan Constant ships that brought over some of our first settlers to Jamestown. It was WAY cool for him to be able to step foot on their exact replicas after just studying about them in school. 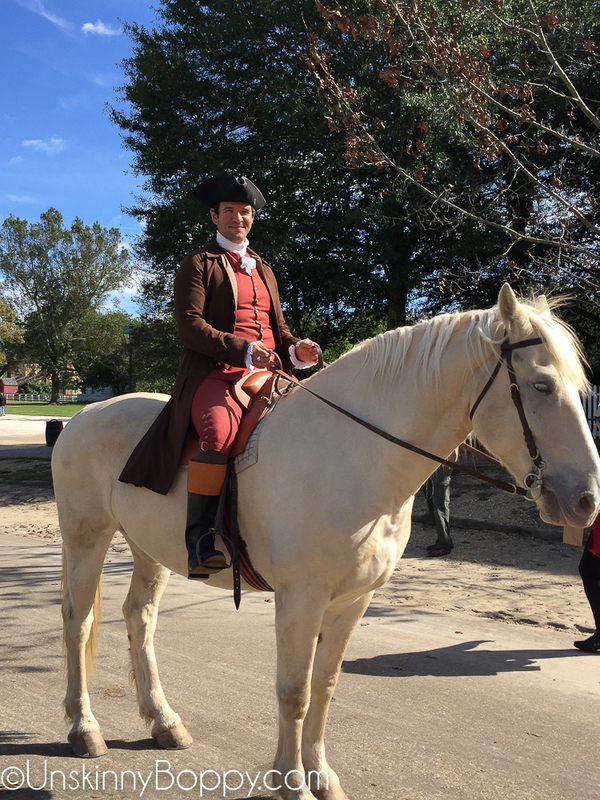 Talk about bringing history to life! 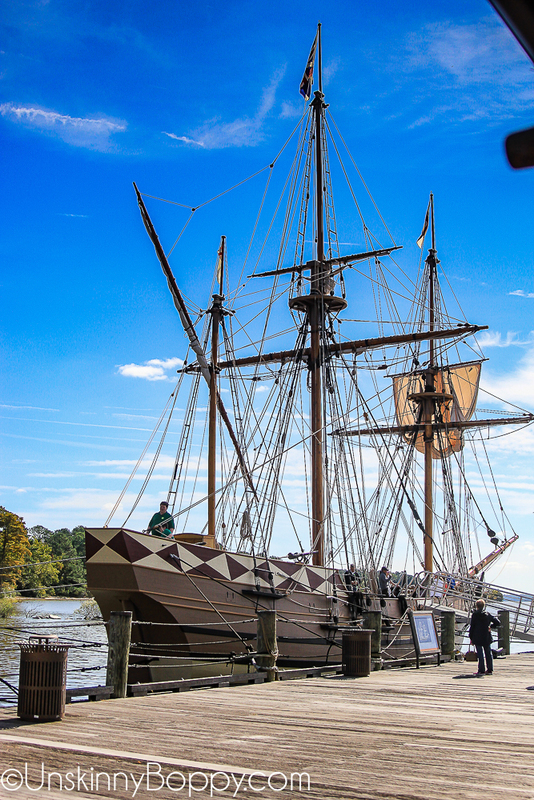 All three ships were easy to access from the dock. This little chickie had to stay safe in her stroller for this part of the trip, though. She didn’t seem to mind. She did love to run around once we got to the Fort part of the settlement. 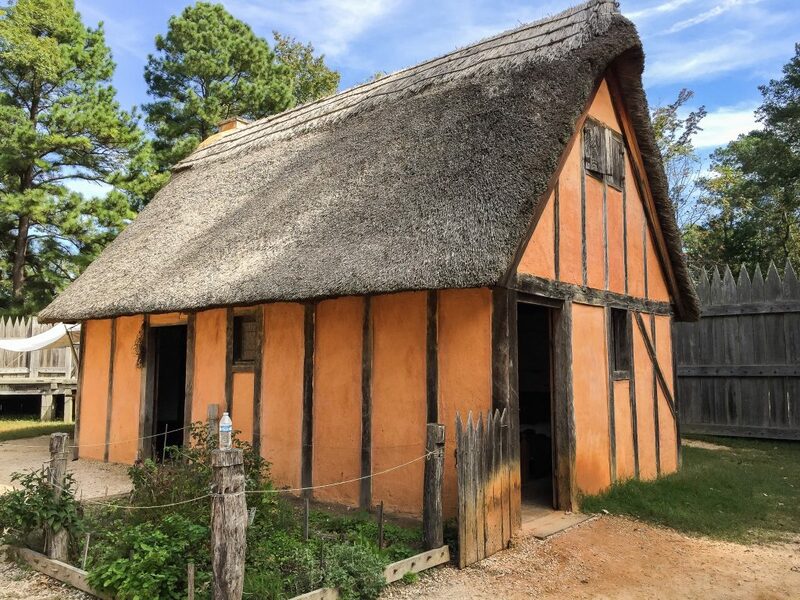 We all enjoyed taking the tour of the fort and the unique orange buildings with thatch roofs. The 1600s must have been a sweaty time with everyone covered in breast plates and iron helmets. For an 8 year old boy, though, this was pretty awesome to re-enact. Once again, Caroline was more into the rocks in the courtyard than the actual buildings. This was another great spot to let her get out of the stroller and run since it was like 95% enclosed in a giant blockade fence. 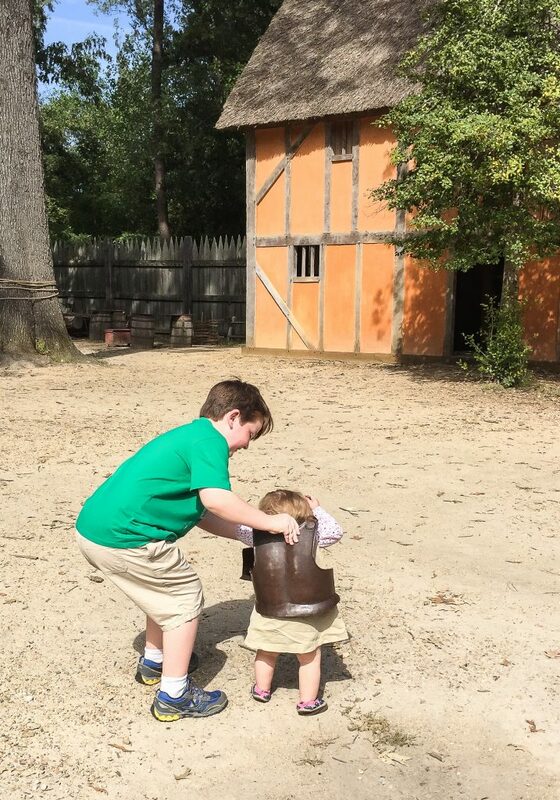 I wonder if forts were a terrific place for 17th century toddlers? Prob not. 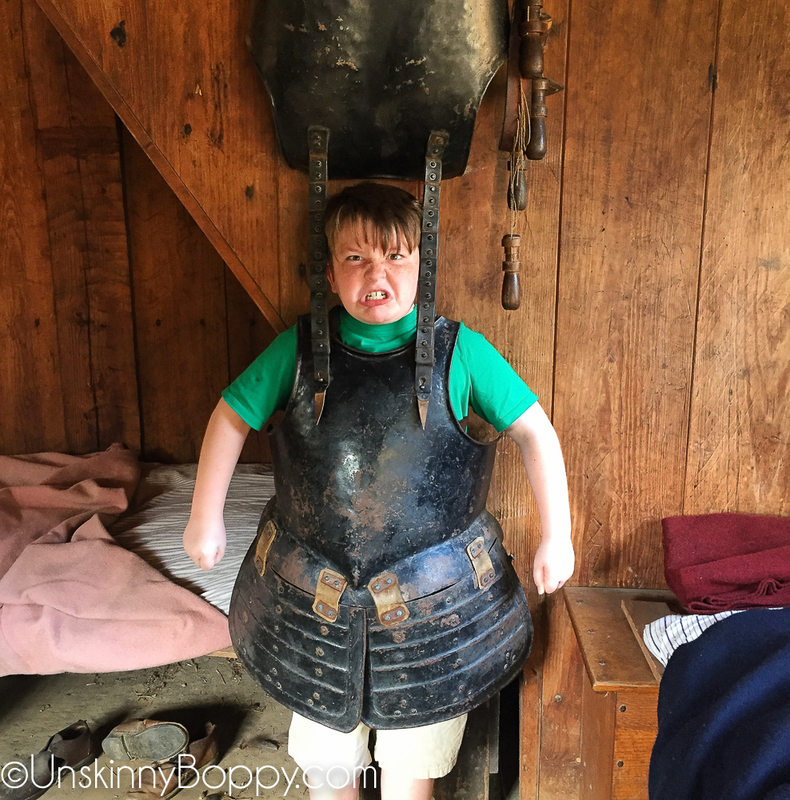 She was not feeling this breastplate at all. I never did find out why all the buildings here were orange. Does anyone know the answer to that? It was a unique style of architecture for sure! 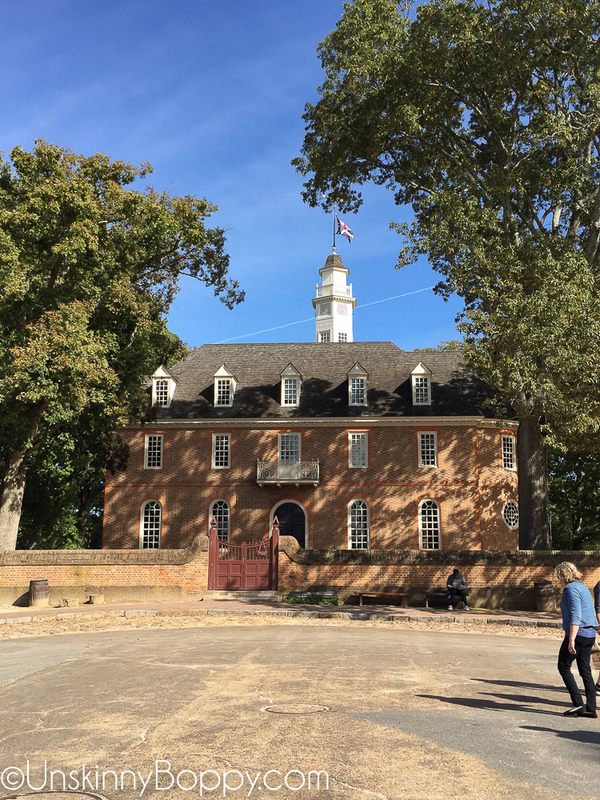 As we stood in the fort, I got a text from Marcia saying they were almost to Williamsburg, so we loaded up and headed back over there for the afternoon. 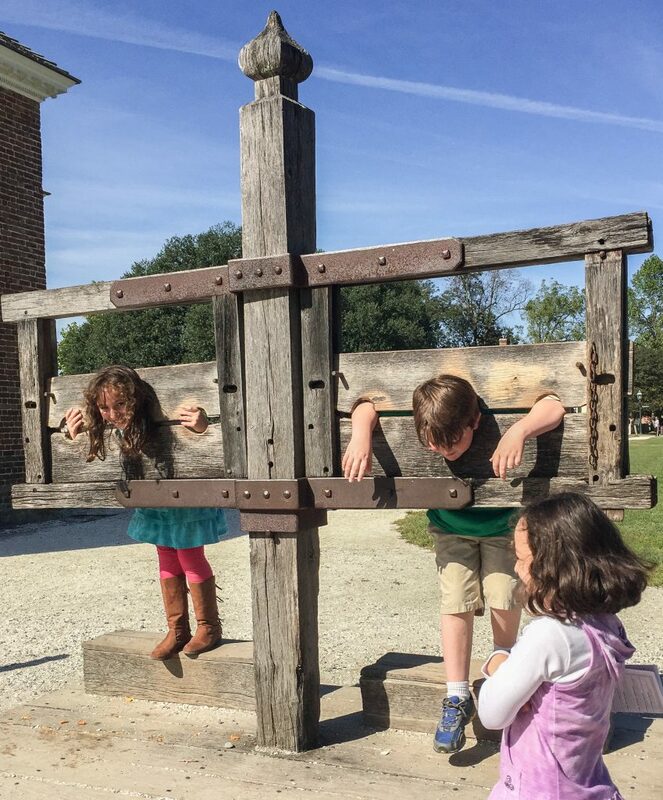 The first thing they wanted to do, of course, was stick their heads and feet in the stocks and pillory. 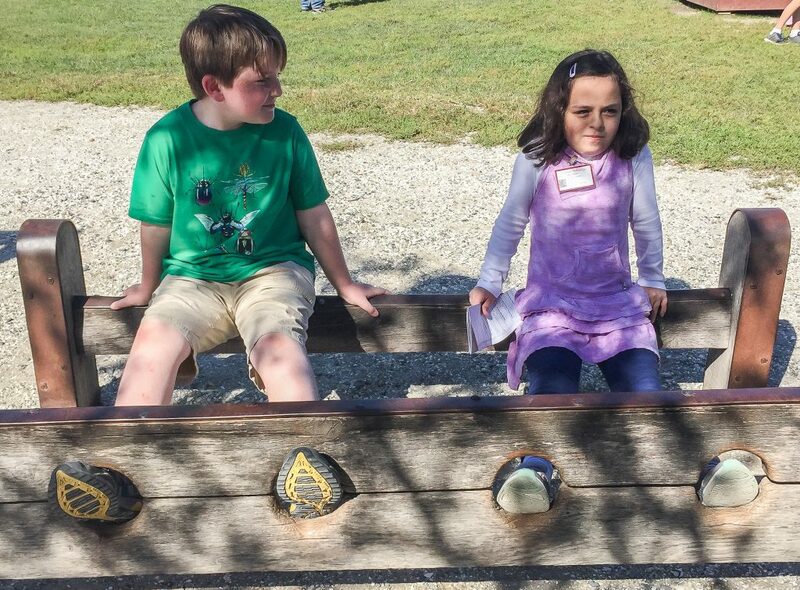 Nothing like medieval corporal punishment to keep the kids entertained. 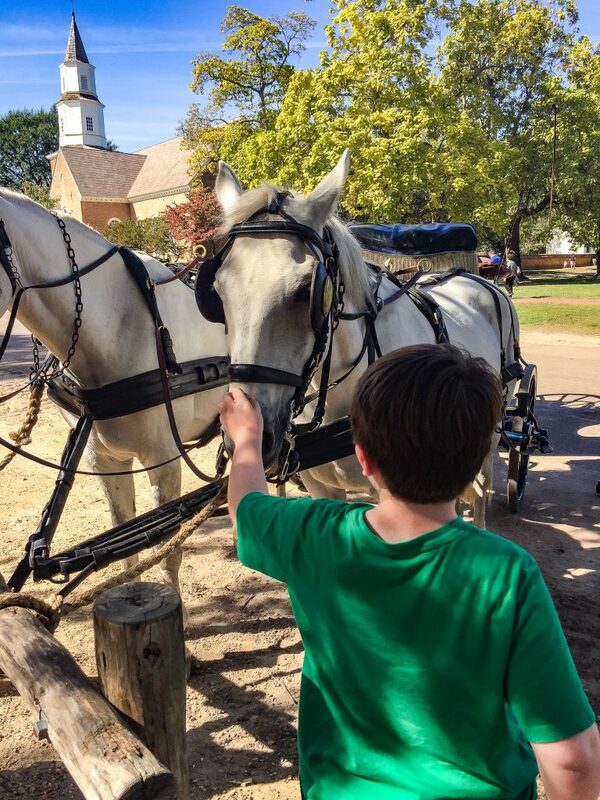 We booked a horse and buggy ride for the afternoon, so we spent some more time exploring while we waited on our ride. This place is so friggin picturesque. I wanted to steal everything I saw and bring it home to my house. 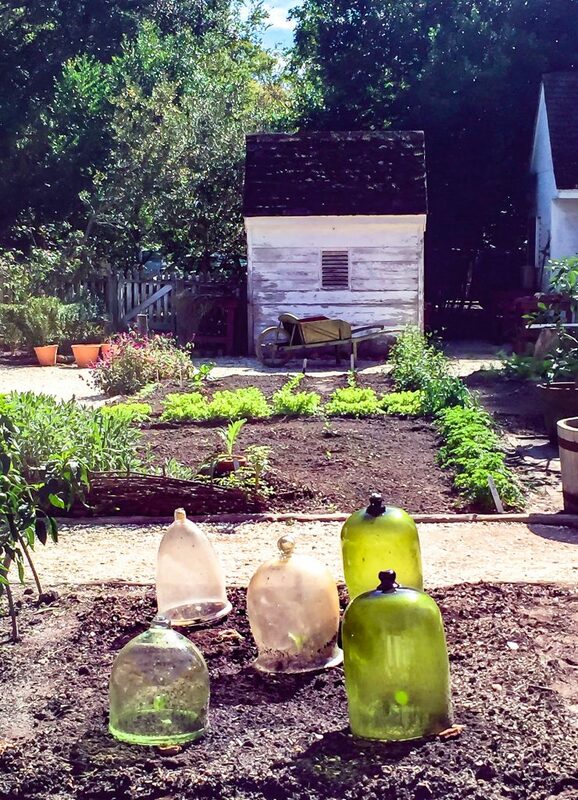 Especially these green glass garden cloches. We walked down to the Capitol but we didn’t go inside. And finally, it was time for our carriage ride! This was what the kids had been looking forward to all day, and it did not disappoint. 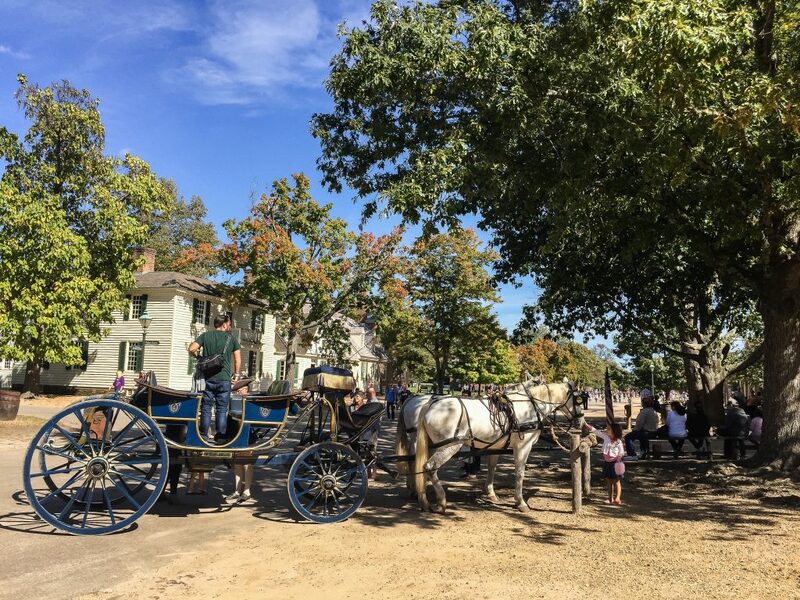 We all loaded up in a covered carriage and lurched down the roads of Williamsburg, taking in the sites. 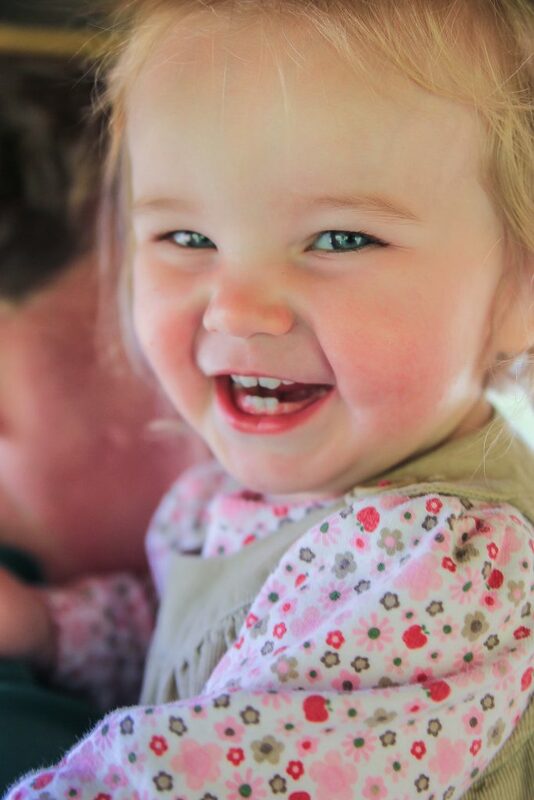 We saw lots of big grins during this ride. 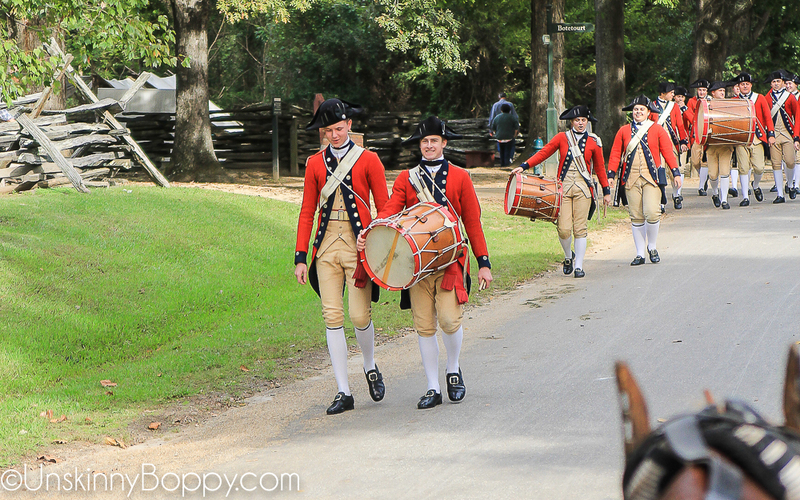 During the ride we ran into a marching band of Redcoats. Everyone is very smiley in Williamsburg! It’s a happy place. They left to drive back to Richmond, and we got packed up since we were flying home the next day. But, the fun was not over yet! 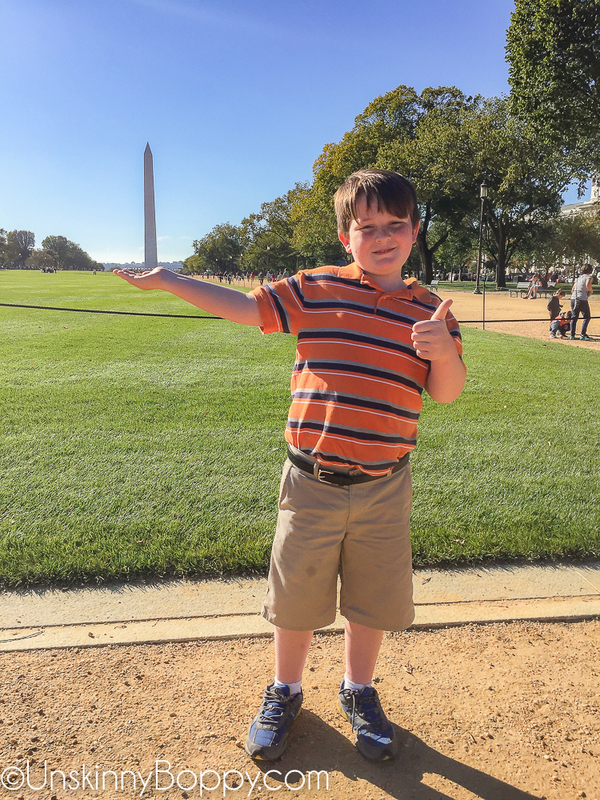 On the drive back to the Baltimore airport, we decided to make a stop in Washington DC show Garrett some of the highlights of our capitol city. It was his very first trip, but will not be his last, I’m sure. 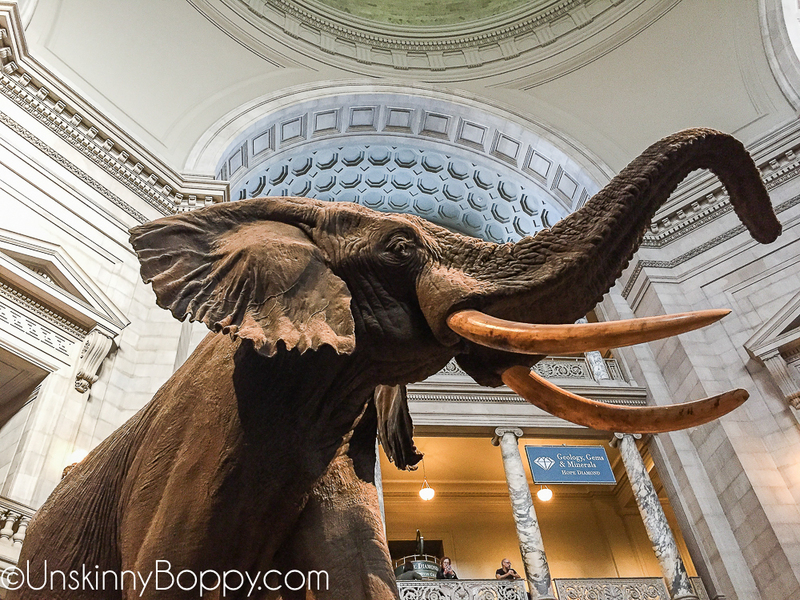 We parked at Union Station and then walked the entire Mall from the US Capitol all the way to Lincoln Memorial, with a side trip through the Museum of Natural History. 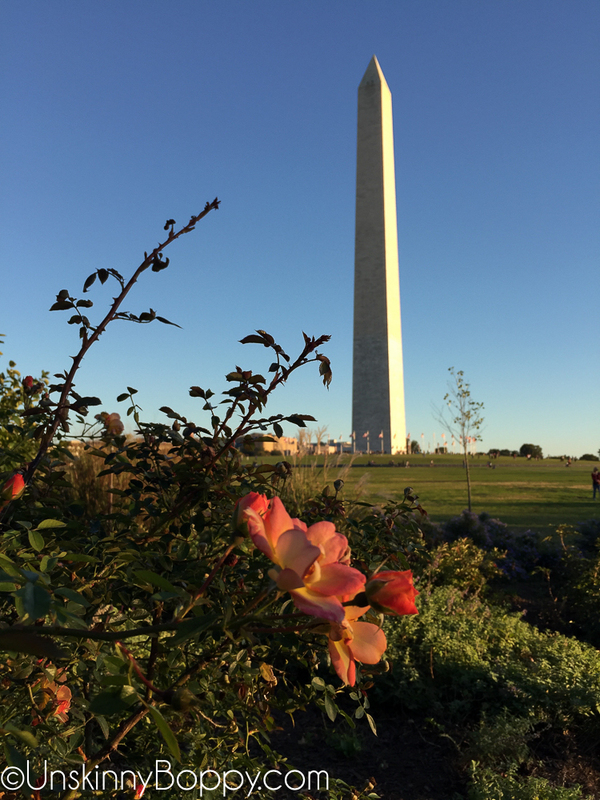 It was another perfect day, so we took our time and strolled down the Mall without much of a rush. 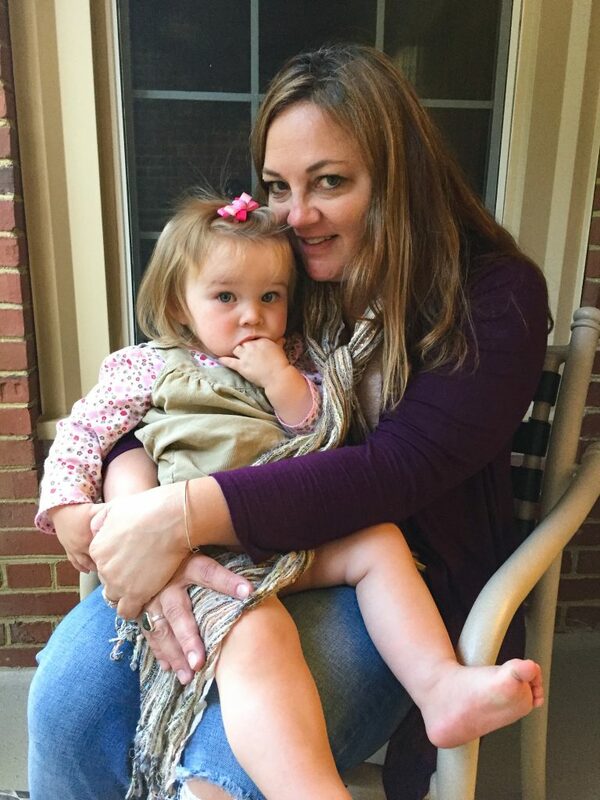 Caroline napped in her stroller along the way. It was just about sundown when we arrived at the Lincoln Memorial, and as we climbed the steps I noticed all these people setting up cameras on tripod and gathering on the steps looking back toward the Capitol Building. 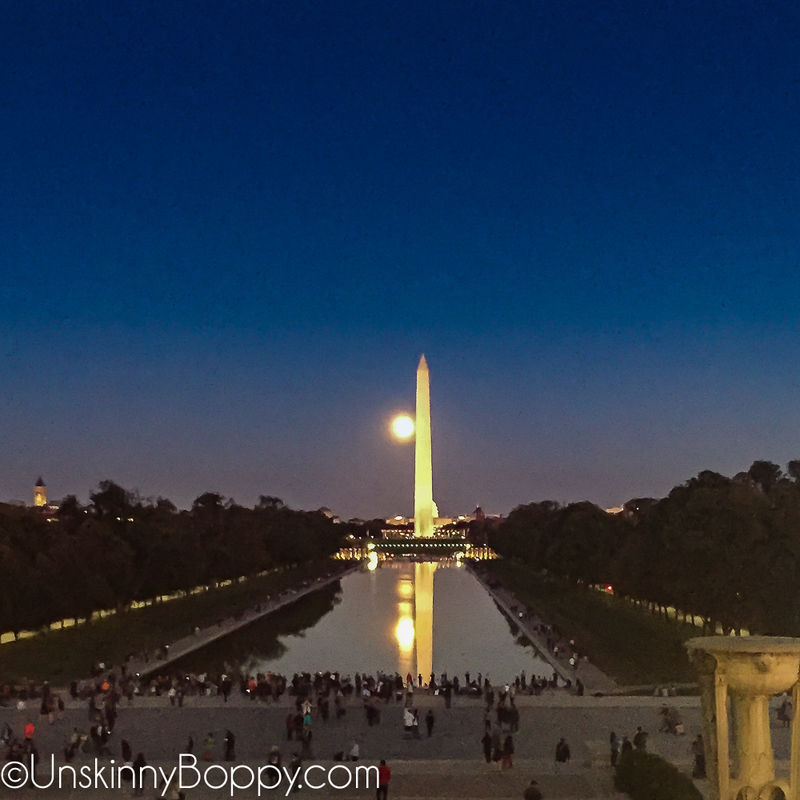 When I turned around, I saw THE MOST GORGEOUS full Harvest moon rising up over the reflecting pool. It was absolutely breathtaking, and of course I had left my big camera down at the bottom of the steps in the stroller. I tried to capture it as best as I could with my iPhone but these pics don’t do it any justice. It was stunning to witness. We sat there for a long time watching the moon come up over our Capitol. 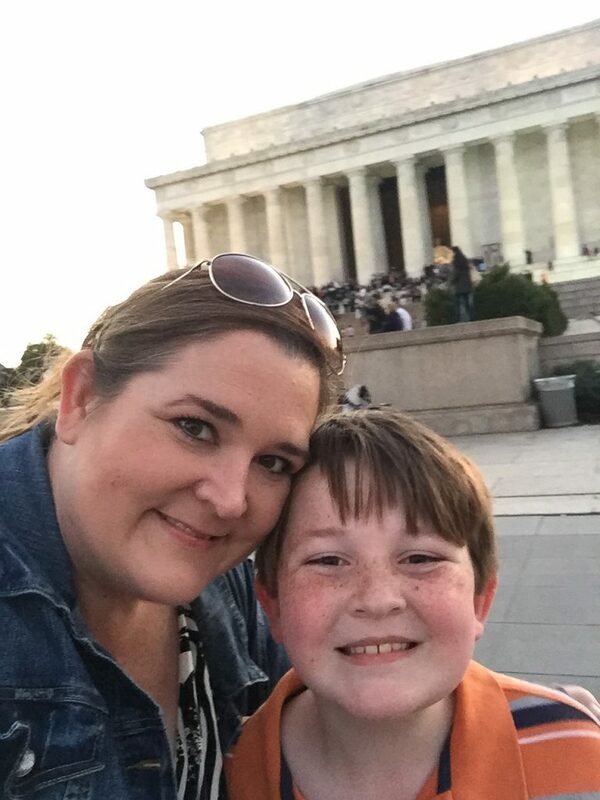 Garrett slid down the slick marble sides of the staircase and we thoroughly enjoyed our time on Lincoln’s memorial. 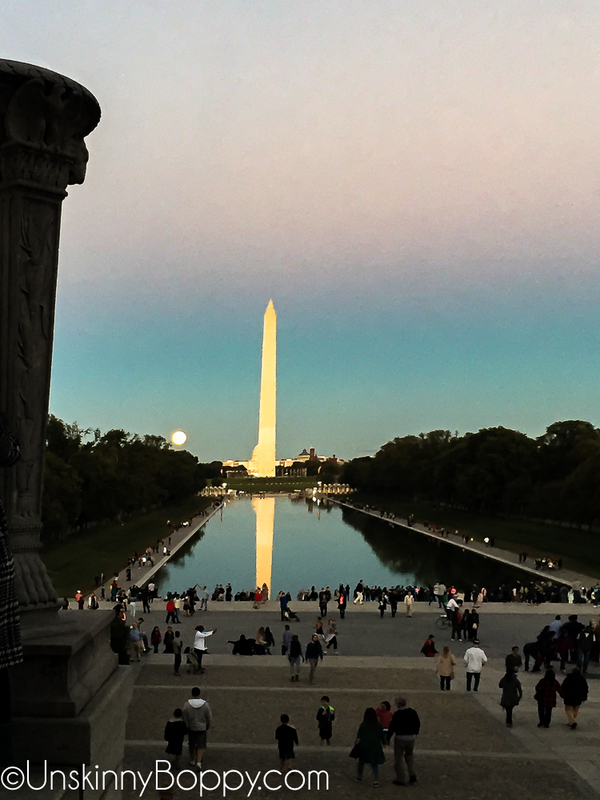 By the time we left, the moon was well over the Washington monument and climbing. We were all SUPER exhausted from walking all day, so we hopped in a cab and headed back to our car at Union Station. 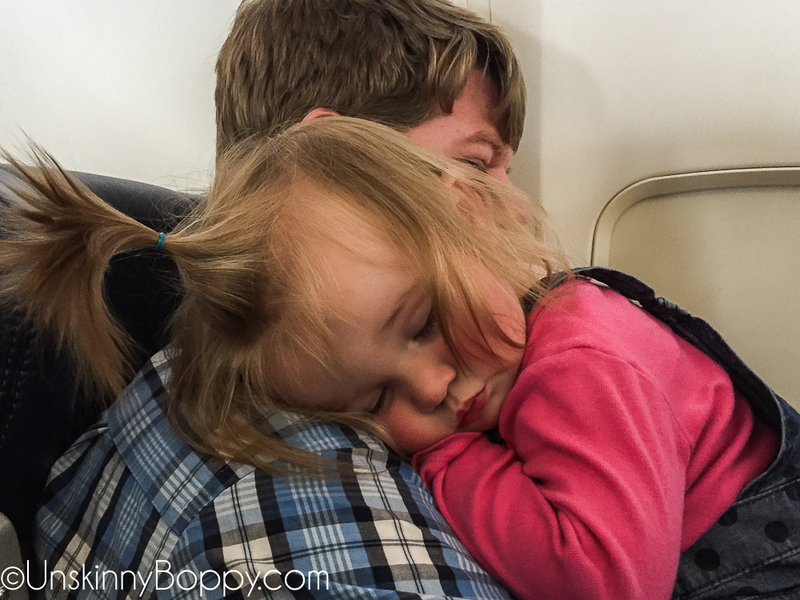 We headed to our hotel by the Baltimore airport and slept great before catching the first flight out to Birmingham first thing the next morning. It was a perfect family vacation!